Who Has the Best Fantasy Football Projections: ESPN, CBS, NFL.com, or FantasyPros? In prior posts, I demonstrated how to download, calculate, and compare fantasy football projections from ESPN, CBS, and NFL.com. In my last post, I demonstrated how to download FantasyPros projections, which aggregate projections from many different sources to increase prediction accuracy. In this post, I will compare fantasy football projections from ESPN, CBS, NFL, and FantasyPros, including our average and latent projections to determine who has the best fantasy football projections. The results are in the table below. The rows represent the different sources of predictions (e.g., ESPN, CBS) and the columns represent the different measures of accuracy. The “average” variable represents the mean of projections from ESPN, CBS, NFL.com, and FantasyPros. The “latent” variable represents the common variance among projections from ESPN, CBS, NFL.com, and FantasyPros. The source with the best measure for each metric is in blue. Note: MAPE was unable to be calculated for FantasyPros and the average because of values of zero in the series (for a discussion on this topic and for reasons to prefer MASE to the other error metrics, see here). In general, projections from FantasyPros were more accurate than projections from ESPN, CBS, and NFL.com, and were also more accurate than our average and latent variables. 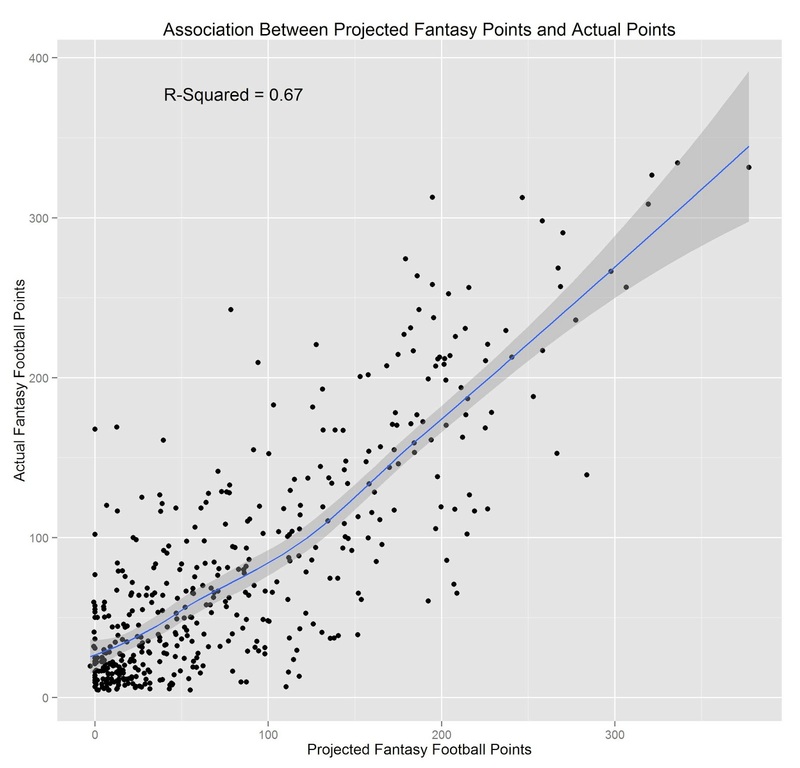 FantasyPros projections explained about 67% of the variance in the actual points scored in my Yahoo league in the 2012 season. Interestingly, the average of the sources was more accurate than any of the individual sources. Even better than the average was a latent variable representing the common variance of the sources, which discards the unique, error variance. The best fantasy football projections in 2012 were from FantasyPros, a site that averages across numerous sources of projections. FantasyPros projections explained 67% of the variance in players’ actual points scored in 2012, and were more accurate than projections from ESPN, CBS, and NFL.com. Now you know where to turn to get the best projections for your fantasy football league. How hard would it be to create a wisdom of the crowd projections utilizing other projections other than espn, yahoo, etc? Great question. If you’re looking for projected player rankings based on wisdom of the crowd, you might try fantasyfootballcalculator.com, which publishes ADP data from thousands of mock drafts (http://fantasyfootballcalculator.com/adp.php). If you’re looking for projected points, I’m not familiar with any sites that calculate consensus projections across thousands of sources. The closest site I’ve come across is fantasypros (http://www.fantasypros.com/nfl/projections/qb.php). That being said, if you find any sites with a wisdom of the crowd approach to consensus projections, let me know! The problem I run into when I try to rate projections is how far to go down in the list of players. The players at the top are the best and score the most and are the hardest to predict closely in absolute terms and yet they’re also the ones people are most likely to put into their lineup. If you predicted Peyton Manning would throw four TDs in Week 1 against the defending Super Bowl champsion Ravens then you would have done a fantastic job. And yet you also would have been off by three TDs. OTOH when you go further and further down the list to players that are less and less important it becomes easier and easier for your predictions to become more and more accurate. You predict the backup RB to have 4 rushes for 15 yards and 1 reception for 7 yards and unless the starting RB gets hurt and the backup RB has to play a lot, your prediction is likely to be within couple points. It is hard to make a prediction within a couple points for a starter but it’s a lot easier to do it for a backup. So if you include too many players in your assessment of projections then you’re including players that are easy to predict and who don’t matter much anyway. And as a result a method that doesn’t predict important players as well may seem good just because it can accurately improve the lesser important players. Or so it seems to me. What sayeth you? I like the site but I’m a SAS user slowly trying to learn R via Robert Muenchen’s book. We’ll see how that goes. Combining a player’s projected points, expected points based on positional rank, and risk, you have the data to make a more informed decision about who to draft. given this analysis, why is FFP not weighted the most heavily in your draft optimizer?